Frequently Asked Questions (FAQ) – Field Drilling Contractors Ltd.
Below we’ve answered the most common questions we receive about drilling water wells. If we’ve missed anything, please feel free to contact us directly and we’ll be happy to help. What can I expect during the drilling process? Once the drill rig is set up over the well location with jacks lowered and the mast raised, our support vehicle with crane will unload 20 foot long steel casing & drilling rods and lay them out behind the drill rig. The driller will then use the winch line on the rig to raise a length of rod and casing into position for drilling. The rod is threaded into the top drive of the rig and the casing is held in place by jaws in both the top drive and bottom table. Once your well is progressing, the crew will weld new lengths of casing onto the previous length that’s sticking out of the ground. The driller will continuously monitor drilling cuttings that are coming out of the hole through the cyclone discharge. 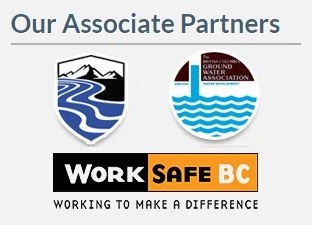 Please Note: Our Crews complete numerous Safety and Training courses in order to operate around the drill rig. For your safety, please keep at least 20 feet away from the drill rig and other equipment while drilling operations are underway. If the rig is left on your property overnight, please ensure that it is not climbed on and the levers aren’t tampered with as this could cause a serious safety risk when the crew re-starts the rig the next day. In Water Well Drilling, overburden is a term used to describe material that lies above bedrock – soil, sand, gravel, till, clay, boulders, cobbles, etc. Just as the name suggests, Bedrock is solid rock that is encountered while drilling. Bedrock can range from broken shales, soft or hard sandstone and solid granite. If bedrock is encountered at your well, the driller will embed or ‘seat’ the steel casing about 5 feet into the bedrock and will then continue drilling with only the drill rods. This is also known as ‘open hole’ drilling. Water enters Bedrock water wells through fractures in the rock. Often, bedrock holes are lined with PVC screens and liner to protect the well pump from falling rock. Should I have a 6″ or an 8″ diameter well? If you’re drilling a well for your house, we recommend a 6” dia. well. The average family of four uses 500 gallons of water per day on average – this includes showering, running the dishwasher, flushing the toilet, etc. So even if your well produces 1 GPM (Gallons per Minute), that’s 1,440 Gallons per day. The largest submersible pump that will fit down a 6” dia. well is a 5 Horse Power, 4” diameter pump that is capable of pumping up to 100 gallons per minute. If you’re after more than 100 gallons per minute (and the water bearing material is present underground) for irrigation or commercial purposes, we recommend moving up to an 8” dia. or greater well. Field Drilling Contractors Ltd. can drill 6”, 8”, 10”, 12”, 16”, 20” and 24” dia. wells. Developing a Water Well is the process of forcing water in and out of the well screen/s to develop a gravel pack. This surging action prevents bridging of water bearing materials outside of the screen and helps draw fine particles through the screen slots and out of the well. Movement of water in only one direction, as when pumping the well, does not produce the proper development effect. 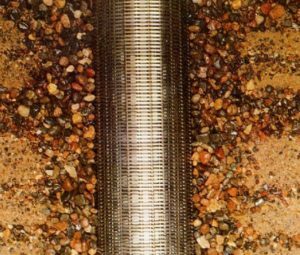 The image below shows a gravel pack around a well screen. How are Stainless Steel Screens installed in the well? Telescopic Stainless Steel Screens are slightly smaller around than the well casing, allowing them to be installed inside the casing to the bottom of your well. Once the screens are set at the bottom of the well, the driller pulls the well casing up in order to expose the screens to the water bearing material. A Riser is a length of steel pipe that is attached to the top of the well screen. This extra length is added to the top of the screen in order to allow the casing to be pulled back above the screen and allow for maximum screen exposure and water flow. What is a K. Packer and Bail Bottom? A K. Packer is a rubber fitting that seals the outside of the Riser to the inside of the well casing. Without this, there would be no way to prevent sediment from entering your well between the screens and casing. A Bail Bottom is a fitting that is attached to the bottom of your well screen. What Site Cleanup is required after drilling is complete? Part of the drilling process includes discharge of materials that are being drilled out of the ground. These ‘cuttings’ travel up inside the drill rods and are discharged out of a Cyclone and on to the ground a short distance away from the well location. The amount of cuttings will depend on the depth of your well. This will be your responsibility to clean up once the drilling rig has been moved off your property. For an additional fee, these cuttings can be collected in a container that is then sucked out by a vacuum truck. Now that my well is drilled, what are the next steps? Once your well is drilled, we recommend you have a Qualified Well Pump Technician Pump Test your well to determine accurate flow & drawdown rate, and take a sample of your water for analysis. Once this is done, the Pump Technician can install the correct sized pump for your well. Contact Frontier Pumps & Installations Ltd. for more information. Do I need to get a permit before I can have my well drilled? No – you do not need a permit to have a well drilled. The Water Sustainability Act (WSA) that was brought into force in 2016 states that you must hire a Qualified Well Driller perform the work for you and all of the drillers at Field Drilling Contractors Ltd. are Qualified Well Drillers. What is a Water License and Use Approval and do I need to have one? If your water well is to be used for domestic/household use only, you do not need to apply for a Water License or Use approval, but you should register your well. If Field Drilling Contractors Ltd. drills your well, we will complete this step for you.